On 3 June 1916 the United States enacted the National Defense Act of 1916. 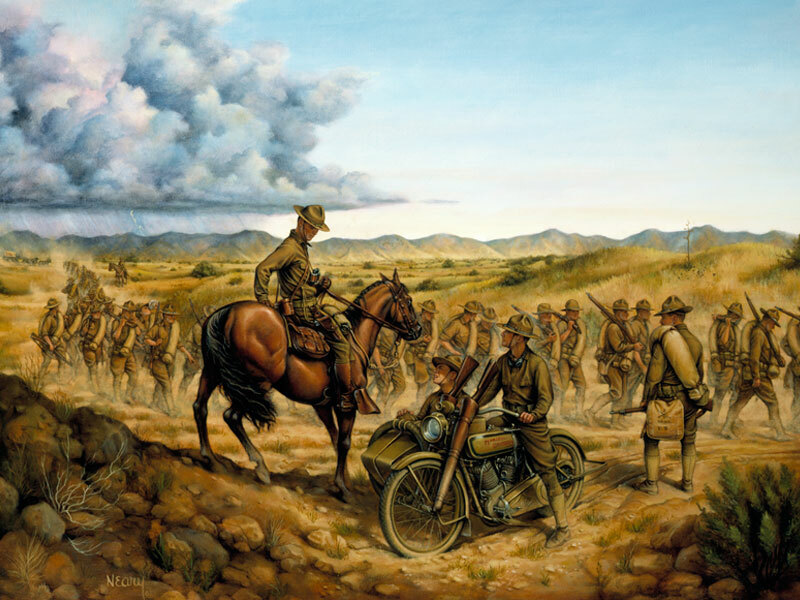 This sweeping revision to the organization of the Army reflected the country's anxieties about maintaining neutrality from World War I, overall military preparedness, and border skirmishes in southwestern states with Pancho Villa. The law was a compromise that reflected disagreements nationally, within government, and inside the War Department about how best to accomplish these objectives. On the one hand, it increased the size of the Regular Army, continued to build what would become the U.S. Army Reserve (originally established in 1908), and expanded and integrated the National Guard as a more responsive reserve force. On the other hand, the law placed limitations on the size and activities of the War Department General Staff (only nineteen were on duty when the United States entered World War I). It also cemented the independence of the War Department bureau chiefs from the Secretary of War and the Chief of Staff, a situation that was not fully undone until the early 1960s. In short, the law reflected the best possible reforms given the country's mood. It both contributed to and restricted America's ability to mobilize for entry into World War I in April 1917. During the administration of President Woodrow Wilson, Secretary of War Lindley Garrison included a study prepared by the Army General Staff entitled "A Proper Military Policy for the United States" in his annual report submitted in September 1915. 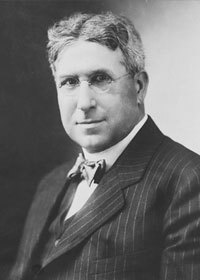 The study advocated that the United States build on the 1903 reforms introduced by Secretary of War Elihu Root during the administration of President Theodore Roosevelt. Instead of relying on an "expansible Regular Army," as Root recommended, Garrison argued that the nation should revert to raising volunteer units for a citizen army as it had done in the Mexican War, Civil War and Spanish-American War. Garrison's plan would have quadrupled the size of the Regular Army to a strength of 400,000 men, increased federal support for the National Guard, and raised another 400,000-man force of volunteers, which he called the Continental Army, to form a reserve that would train and remain under federal control. President Wilson was willing to ask for only a modest increase to the Regular Army, but approved the Continental Army concept. The proposal found favor in the Senate, but met serious opposition in the House of Representatives from supporters of the National Guard, who saw the creation of a federally-controlled reserve force as detrimental to the interests of the several states' National Guard. Influential congressmen countered with a bill to increase federal support and responsibility for the Guard and required it to meet standards set by the Regular Army in return for an agreement to perform federal service when the president called it into service. Wilson decided to support the latter plan, which caused Garrison to resign. The bill may have remained under debate in the House had not Pancho Villa raided the town of Columbus, New Mexico, in March of 1916. With the small Regular Army not capable of mounting the so-called "Punitive Expedition" in pursuit of Villa and adequately protect the entire length of the U.S. border against continued attacks, the two houses of Congress reached a compromise. The new legislation incorporated the concept of a citizen-army that could mobilize in a national emergency, but with the National Guard providing its nucleus in the absence of the proposed Continental Army. The two bills were reconciled and passed both houses of Congress as the National Defense Act in May, which President Wilson signed into law on June 3, 1916. The act authorized an increase to the peacetime strength of the Regular Army to 175,000 soldiers over the next five years, with an authorized wartime strength of 300,000. The National Guard expanded fourfold to 400,000 men, with the requirement to follow federal organization and training standards, and respond to a presidential call to active duty. The new law authorized the National Guard to use federal funds to pay for 48 days of drill a year, as well as a 15 day period of annual training, which marked a significant improvement over the previous authorization of five days of summer camp, and no federal funds for drills. Furthermore, the Act set qualifications for National Guard officers, and allowed them to attend Army schools; and required all state units to be organized according to the standards of those in the Regular Army. The 1916 Act authorized the President to mobilize the National Guard in case of war or other national emergency, and retain it on active service for the duration of the event. Where the National Guard had previously been limited to service within each state, or federal activation within the United States for up to nine months, it could now be federalized for overseas service and could be called up for an unlimited duration. Although the law did not form the proposed Continental Army, the act authorized the formation of a citizen army during wartime and established both an Officers' and an Enlisted Reserve Corps to provide the cadre for the new force. Under the terms of the act, the Officers' Reserve Corps absorbed an expanded Medical Reserve Corps, which had been originally established in 1908, and filled its other vacancies from the newly created Reserve Officers Training Corps. So as to not compete with the National Guard, the Army was prevented from recruiting volunteers to fill the units in time of war until after the National Guard had been called up. This provision eliminated the need to create the state-raised volunteer forces from the militia that had been used to by-pass previous restrictions on the state forces experienced in the nation's earlier conflicts. The 1916 Act also allocated over 17 million dollars for the Army to acquire 375 new airplanes, and created the Air Division to administer the Aviation Section of the Signal Corps, with its base at Langley Field, Virginia. This marked a substantial increase in the size of the flying service which at the time had only one aero squadron. In the debate over preparedness, Congress expressed its concern with the supply of nitrates for use in manufacturing munitions in the event of war. As a result, the 1916 Act authorized the construction of two nitrate-manufacturing plants, an industrial village, and a dam to provide them hydropower. 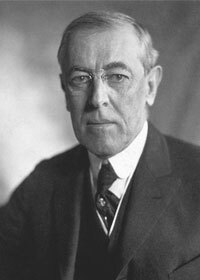 President Wilson chose Muscle Shoals, Alabama, as the site for the dam, later named Wilson Dam in his honor. The dam and nitrate plants built at Muscle Shoals were later absorbed into the Tennessee Valley Authority in 1933. In addition, the President requested that the National Academy of Sciences establish the National Research Council to study the potential of mathematical, biological, and physical science applications for defense. The Act also granted the president the power to place orders for defense materials and forced industry compliance. 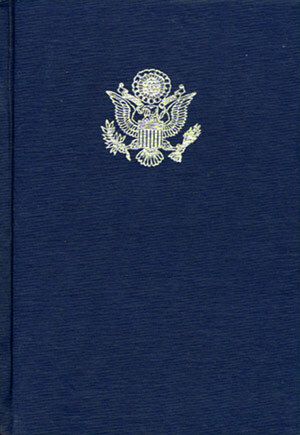 The role of the secretary of war also expanded to include responsibility for of surveying all of the nation's arms and munitions industries, which later led to Congress passing legislation to create the all-civilian Council of National Defense, composed of leaders from industry and labor, supported by an advisory commission of executive branch department secretaries, to study economic mobilization in the event of war. Despite its shortcomings, the National Defense of 1916 contributed to the nation's ability to mobilize when it declared war on Germany in April 1917. It expanded what would become the U.S. Army Reserve, integrated the National Guard as a more responsive reserve, and improved cooperation with the Regular Army. The law established the framework for today's Total Force Army. 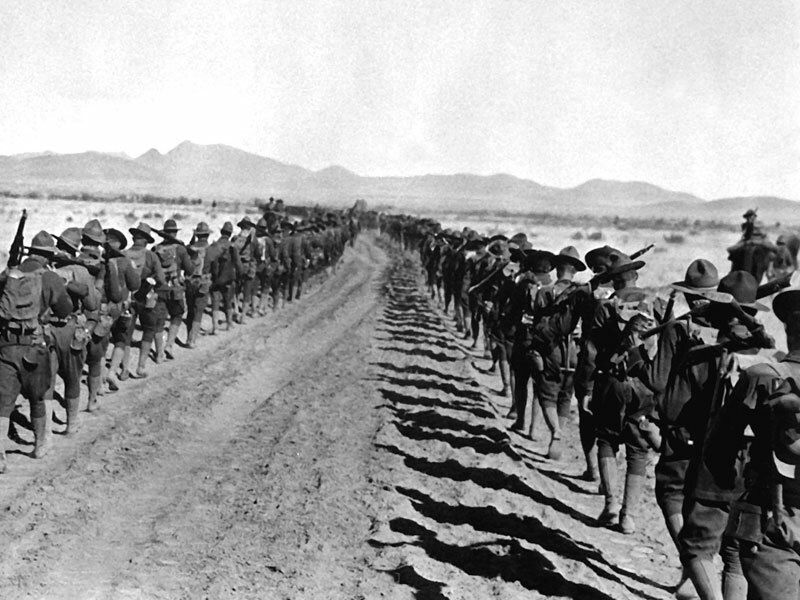 A column of soldiers from the 2d Infantry Regiment, Connecticut National Guard on the march in Arizona. 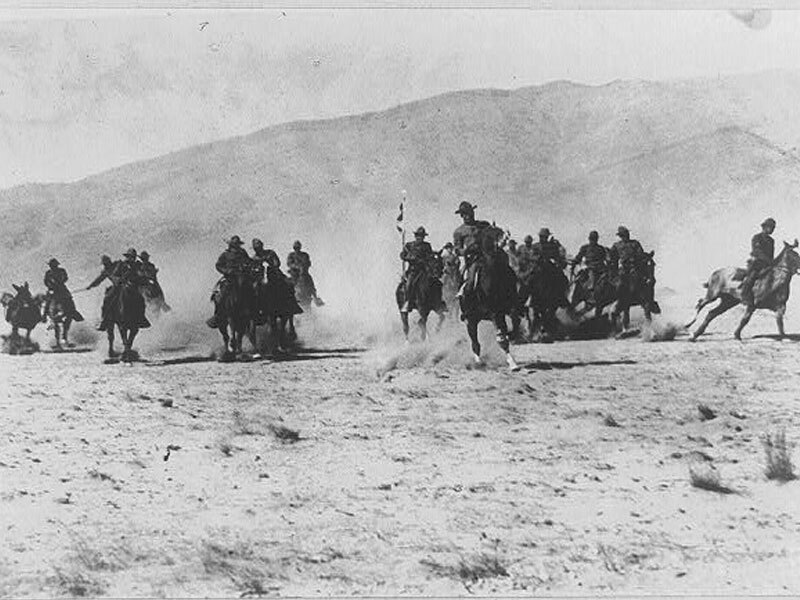 Practice charge of Machine Gun Troop, 8th Cavalry during training in Texas. 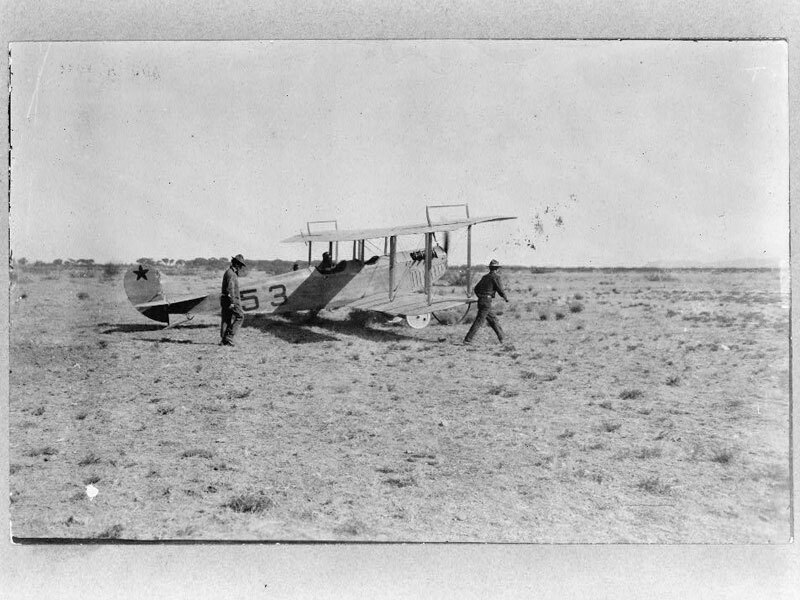 Lt. C. G. Chapman of the 1st Aero Squadron taking off in his JN-3 on a scouting mission from Casas Grande. 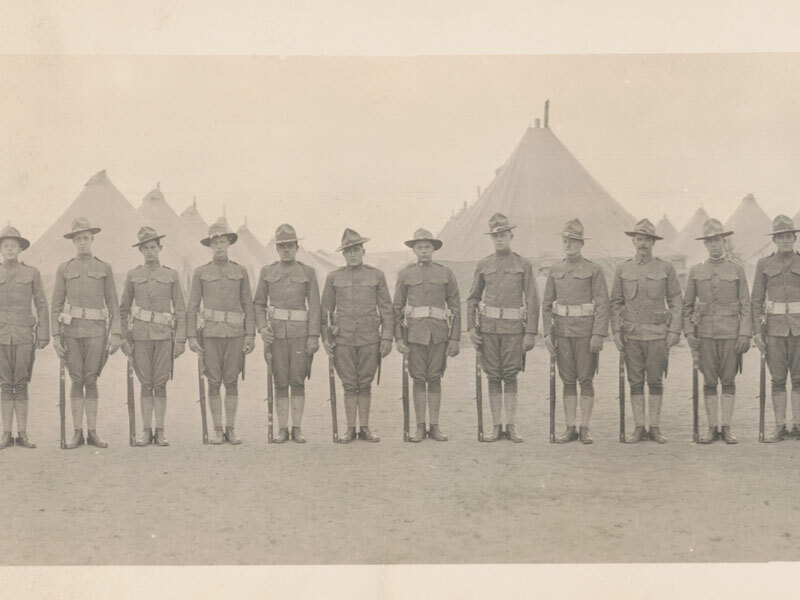 The soldiers of Company H, 5th Regiment of Infantry, Maryland National Guard at Eagle Pass, Texas, were typical of the many National Guard troops called into federal service for duty on the Mexican border.